Yeah, what I said yesterday but even more so. Maybe we should blame the mascot. Yes, let's turn on our mascot. The campaign for #GunnersaurusOut starts here! 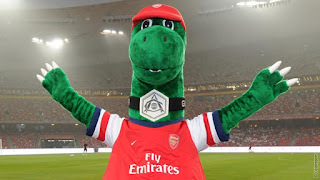 But if we ditch Gunnersaurus who could possibly replace him? There aren't internationally renowned and talented mascots available at the drop of an over-sized red hat. We had our chance when Borussia Dortmund's Emma the Bee became briefly available last summer but isn't just typical of Arsenal that they dithered and we lost her to Man City.